Today, the game Monopoly and its iconography remain symbols of wealth and excess. But it didn't start that way, explains Mary Pilon, author of a new book on the game. NEW YORK (TheStreet) -- Today, the game Monopoly and its iconography are a symbol of wealth and excess. The mustachioed and monocle-wearing Monopoly Man stars in a brilliant Saturday Night Live skit in which Jon Lovitz portrays him as a criminal lawyer with a penchant for Get Out of Jail Free cards. He is lampooned at a fancy soiree by Jim Carrey in "Ace Ventura When Nature Calls." Shortly after the 2008 Financial Crisis, Mr. Monopoly could be seen on the signage for Occupy Wall Street, and several artists and comedians have incorporated him in their imagery questioning the recent economic downturn. Even famed bond investor Bill Gross invoked the game and its messaging in his January investment outlook, proposing that a new version involving central banks and Quantitative Easing be introduced. However, Monopoly was originally conceived as a protest against capitalism, rather than a rallying cry for it. The game's story begins with Lizzie Magie, a left-wing feminist who received a patent for her "Landlord's Game" in 1904, more than 30 years before Parker Brothers began manufacturing Monopoly. The game was designed to explain and spread the ideas of the economist Henry George. George and his followers were among those observing the rise of new monopolists -- Andrew Carnegie, John D. Rockefeller, J.P. Morgan -- to name a few, and questioning their role in society. An amount of wealth was being created that America had never seen before and George was among those questioning its creation and distribution. George's book, Progress and Poverty, was a best-seller when it was published in 1879 and he regularly spoke to sold-out crowds. George was a proponent of a "land value tax," also known as a "single tax." He believed that individuals should own 100% of what they made or created, but that everything found in nature, particularly land, should belong to everyone. Land was not meant to be seized, bought, sold, traded, or parceled up into city blocks where people were forced to pay exorbitant rents. If people did own land, they should pay a tax for that privilege. Lizzie Magie and her fellow Georgists believed that the single tax would allow the poor and the working classes to keep more of their hard-earned dollars and poverty levels would diminish. It would boost production, as workers would be happier and healthier and force business owners to improve working conditions. George's philosophy is credited with influencing Winston Churchill, Frank Lloyd Wright, and Leo Tolstoy. He and Magie sometimes referred to themselves as "anti-monopolists." When George died in 1897, many of his followers feared that without their magnetic leader, the ideals he espoused would be lost forever. Yet seven years later, Magie received a patent for her game that she hoped could be a teaching tool for the Georgist cause. The Landlord's Game flourished among left wing intellectuals, including at Arden, Delaware, a single tax colony. Early players included Upton Sinclair, Franklin Delano Roosevelt advisor Rex Tugwell and Scott Nearing, a champion for academic freedom and a pioneer of the green movement. As players worked their way around the board, they performed labor and earned wages. Each time they passed the Mother Earth space, they were "supposed to have performed so much labor upon Mother Earth" that they received $100 in wages, she said. Those who ran out of funds went to the Poorhouse. She also inscribed three words that have endured for more than a century: Go To Jail. Sound familiar? 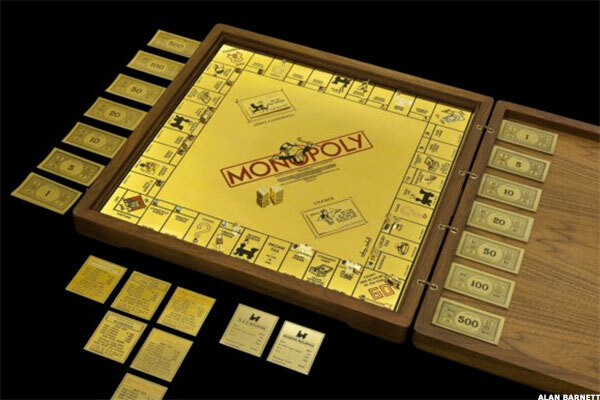 The origin story was largely lost until Ralph Anspach, an economist who made his own Anti-Monopoly game in the 1970s, became locked in a legal battle with Monopoly's makers, Parker Brothers (Hasbro (HAS - Get Report) ), and accidentally unearthed her story. Anspach, without realizing it at the time, was also bringing the game back to its anti-establishment roots. Much of Anspach's legal research centered on proving that Monopoly had a life long before Parker Brothers began publishing the game in the mid-1930s. This year, Hasbro unrolled a lavish promotion to commemorate this year as the 80th "anniversary," of Monopoly. The effort included real money inserted into select sets this month in place of play money, tickling the sensibilities of even the surliest board game fans. Given the game's true past, which Parker Brothers has sought to suppress, it's easy to be cynical about the game's "anniversary." The new Monopoly money promotion may fit into another recurring theme of the game's history: irony. Mary Pilon is the author of The Monopolists, a book about the secret history of the board game Monopoly (Bloomsbury, February 2015).